If your Moen kitchen faucet comes equipped with an attached sink sprayer, the faucet must have a sink sprayer diverter. This functions in much the same way as a tub/shower diverter except you don't have to manually activate it. When you turn on the sprayer, water pressure moves the diverter into a position that prevents water from flowing to the spout, and all the water comes out of the sprayer. 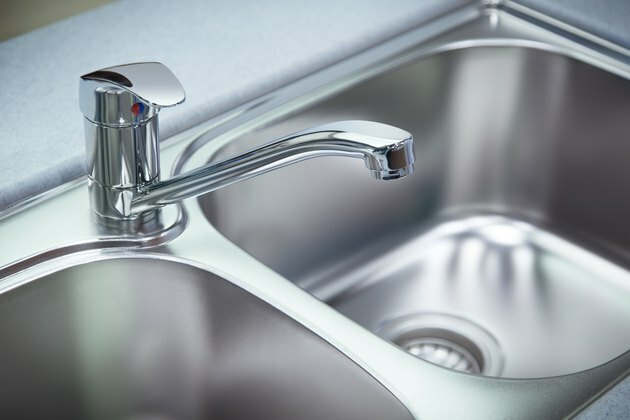 All faucet parts eventually wear out, and when that happens to the diverter, the spout won't shut off completely when you use the sprayer, and the spray pressure is low. Sometimes the diverter just needs cleaning, but it's an inexpensive part that's readily available online or at stores, so replacing it is usually a better option. To do either, you have to know how to remove it. Moen has employed more than one diverter design over the years. Some faucets have a collar-type device that fits over the valve housing at the base of the spout. On other models, the diverter is a cartridge inserted into the valve housing at the base of the spout. On two-handled models, the diverter is a tee fitting that attaches to the supply hoses underneath the sink, and you can remove this without disassembling the faucet. You'll have to remove the handle and spout to access the collar diverter. This isn't challenging, but remember to turn off the water valves under the sink before you start, or an easy procedure can quickly become complicated. Locate the cap covering the set screw that holds the handle. It's plastic, and it bears the blue/red Moen logo. Pry this off with a flat-head screwdriver to expose the screw. Remove the set screw with a hex wrench. You'll probably need a 1/8-inch hex wrench, but on some models, the screw is slightly larger. Unscrew the Phillips screw holding the temperature limiter and lift it off the valve housing. Not all faucets have this part. Unscrew the retaining nut holding the cartridge in place using locking pliers. You don't have to remove the cartridge, but the nut will prevent you from pulling off the spout, so it has to go. Grasp the spout and wiggle and turn it as you gently lift it off the valve housing. When you get it off, you'll expose the collar diverter, and you can just lift it off. Sometimes the diverter comes off with the spout, so check inside the base of the spout if you don't see the diverter on the faucet. If your faucet has a cartridge diverter, follow the same procedure for disassembling the faucet. When you get the spout off, you'll see the diverter cartridge sticking out from the side of the valve housing. Grasp it with pliers and pull, and it should come right out. Access a tee diverter for a double-handled faucet by going under the sink. You'll see three hoses connected to it with quick-release connectors; two go to the faucet handles and one goes to the sprayer. To disconnect the quick-release connectors, push down on the top of the fitting while you pull on the hose. After disconnecting all the hoses, remove the diverter, which is connected either with a quick-release connector or a nut that you can loosen with pliers.